True Torah Jews takes no responsibility for its content. The rising tensions in Jerusalem in recent weeks escalated even further on Sunday morning with the injury of two police officers and 24 Palestinian protesters on the Temple Mount. The events on the Temple Mount, which attracts both Israeli and Palestinian fanatics, has been receiving more and more attention from the security establishment recently. Most striking, on the Israeli side, have been the activities of various organizations which have managed to advance their interests by securing the support of right-wing Knesset members. On the Palestinian side, the Palestinian Authority has been responding to the increased presence on the Temple Mount of Hamas and similar organizations. It seems that Hamas has recognized, rightly so, the Temple Mount’s potential for reigniting an intifada in East Jerusalem and the West Bank, while it upholds the ceasefire on the Gaza-Israel border. The Israel Police have deployed a large contingent to keep the peace on and around the Temple Mount. But, aside from their goal to keep the peace, the police are under constant criticism from the right-edge of the political spectrum, which claims that they are giving in to Palestinian demands on the Temple Mount and failing to act against Muslim stone-throwing at both Jews praying at the Western Wall and the security forces. The tensions on the Temple Mount become even more important due to the stalemated negotiations between Israel and the Palestinian Authority. Most media attention has been directed toward the American attempt to guarantee continuation of the talks until the end of the year, at the least, by securing prisoner releases and creating other incentives. At the same time, the PA has resumed threatening to dismantle itself, which would force Israel to take responsibility for civil administration in the West Bank. But, in actuality, it seems that the biggest threat of escalation is events on the ground – from tensions between extremist settlers like those in Yitzhar and their Palestinian neighbors to the clashes on the Temple Mount. It is also important to note that struggle for control of the Temple Mount has historically been a contributing factor to escalation between Jews and Palestinians – from the 1929 riots, to the clashes in 1990, and the outbreak of the Second Intifada in 2000. In retrospect, Passover 2014 might be remembered as a turning point in the escalation of violence on the Temple Mount. As with every holiday, increased tensions were certainly felt over Passover, but this time, it seems that conditions for increased violence on the Temple Mount were perfect. On the Jewish side, the various “Temple movements” (there are around 30 organizations clamoring to rebuild the Jewish temple or reinstate ritual sacrifice), have made unprecedented achievements in bringing the notion of altering the status quo on the Temple Mount into Israeli public discourse. The issue is also on the daily agenda of various Israeli MKs and ministers, including Uri Ariel, Moshe Feiglin and Miri Regev. In recent months, not a day has gone by without some kind of incident between Jews attempting to enter the Temple Mount and police. Sometimes it’s yeshiva students caught with tefillin. Other times, important rabbis or MKs are refused entry to the mount. But despite what seems like the police being overly strict with its policies toward Jews, Temple Mount activists should be more than satisfied with their achievements over the last year. Temple activists have managed to get questions of the mount into Israeli public discourse, and not just as a matter of Israeli sovereignty, but rather as a question of Jewish religious freedom. Roughly two months ago, the Knesset held its first discussion of the issue. The Internal affairs committee, headed by MK Miri Regev, has held numerous discussions on the subject, and has also created a subcommittee to examine religious freedom on the Temple Mount, headed by MK David Tsur. Even Transportation Minister Yisrael Katz, not considered a supporter of the Temple Mount activists, has written on his Facebook page in favor of changing Israeli policy on the mount. No less important is the fact that a decade ago only a handful of Jews would periodically visit the Temple Mount. Now, they come out in droves. Most of the visitors wear knitted yarmulkes, although some soldiers visit as well (within the framework of historical and cultural trips,) as do students, women, secular people and even some ultra-Orthodox, even though for the ultra-Orthodox, visiting the Temple Mount used to be forbidden under any circumstances. Jerusalem's police, which have been stretched thin with the weekend activities, the Christian Easter holiday, the Passover holiday and last night’s “Big Bong Night,” has been subject to criticism from both the public and politicians over the perception that it has given in to Palestinian violence on the Temple Mount. As such, efforts have been made over the last few days to allow Jews to visit the mount despite the violence. Only small groups have been allowed to up for short, rather unsatisfying visits, as far as they’re concerned. A senior police official admitted that the insistence on opening the mount to Jews and tourists is a matter of principle, to show Palestinians that violence does not pay off. For Temple Mount activists, Passover is considered the peak time of year, due to the commandment of ascending to the Temple and offering sacrifice, which they see as one of the most important commandments in Judaism. “If the prime minister would allow it, Jerusalem would be bustling with thousands of young lambs and goats being brought to sacrifice by Jews fulfilling this most important of commandments from the Torah,” read a statement jointly published by the temple movements. “It is the only commandment, aside from circumcision, that is punishable by karet [a kind of spiritual punishment equivalent to cutting off the soul from God]” adds journalist Arnon Segel, one of the Temple movements’ leaders. As with every Passover, goat sacrifice “practice runs” took place in the Kiryat Moshe neighborhood of Jerusalem, and eight activists were arrested en route to the Temple Mount carrying a goat. In contrast to years past, this time it seems that the Palestinian side is taking rhetoric about changing the status quo rather seriously. The security establishment has also indicated that there is a connection between the breakdown of negotiations and the escalation of violence in Jerusalem in general, and the Temple Mount specifically. The relative weakness of Fatah in Jerusalem has also been a contributing factor. The police are well aware of the back and forth between the Jewish Temple activists and Islamic activists, “they are very attentive to every discussion in the Knesset, every committee meeting, as well as to websites for the Jewish movements, and they respond immediately,” said one police official. Escalation has been slow but steady. 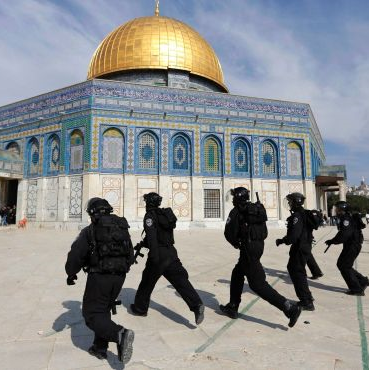 Over the last year, police forces have entered the Temple Mount on every holiday. But this Passover, police have been on the Temple Mount every day, and there has been a significant increase in violence, as well as the use of firecrackers thrown at police. Every police entry to the Temple Mount includes almost 2,000 police personnel, and ends with 15 injured Palestinians, on average. Since 2003, when the mount was reopened to visits from non-Muslims, no police personnel have entered the mosques there. The decision for police to enter the mosques, if it comes, will be made by senior Israeli leadership. In the meantime, the Palestinians have taken advantage of the Israeli reluctance to enter the mosques. Every day during this holiday, Palestinians have prepared for a battle of attrition against the police on the mount. They arrive in the evening, barricade themselves inside the AL Aqsa Mosque, equipped with stones and firecrackers, and wait until morning. The mosque doors are the flashpoint for violence – that’s where the crossfire happens, stones and firecrackers in exchange for tear gas and stun grenades. This push for Jewish rights on the Temple Mount is totally irresponsible and could endanger Jews everywhere. The "temple movements" seem to be indifferent to loss of life; they care only about the advancement of their ultra-Zionist agenda. Taking over the Holy Land and creating a state before the coming of the messiah is not enough for them. They must have the Temple Mount too, and eventually they will want to build the Temple themselves. They want to take the concepts and places most holy to Judaism and desecrate them, just as they have desecrated the Holy Land. These provocateurs are mostly Orthodox Jews, so Orthodox Jewish organizations and communities throughout the world have a responsibility to condemn them in the strongest of terms, distance themselves from them and reiterate the ban on Jews entering the Temple Mount, agreed upon by all rabbis and kept by Jews in all generations since the destruction of the Temple 2000 years ago.